Are you a food enthusiast with a flair and passion for cooking who is looking to learn how to set up a food blog and share your talent with the world? Presented below is the simplest way to create a recipe blog with WordPress. While there are many blogging platforms that let you create a blog, WordPress is believed to be the best blogging platform by many pro bloggers out there. We have talked about it many times, haven’t we? 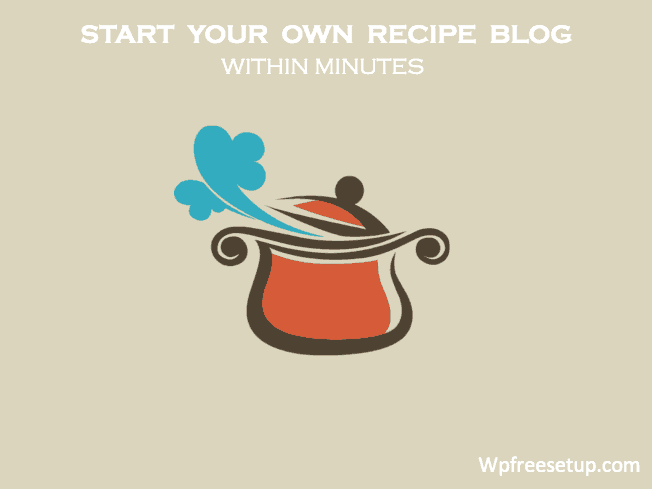 Patiently and vigilantly reading this guide will enable you to create a recipe blog with WordPress within a couple of hours and with very little investment. To know more about WordPress, I suggest you give the links below a read before you proceed. 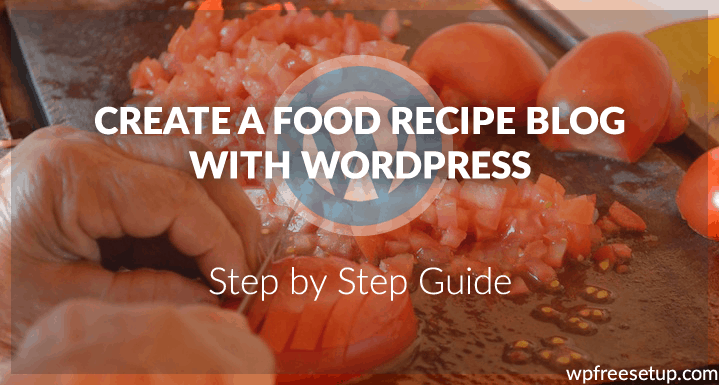 Why Use WordPress to create a recipe blog? Decide the name of your blog. Better select a small name that creates a brand image. Ensure that the name of the blog is not lengthy or a tongue twister. Simpler the better. Once you are ready with the domain name, it is time to buy the domain. .com for a commercial blog. .org for a non-profit blog. .uk for blogs targeting audience of The United Kingdom. .in for blogs targeting the Indian audience. For example, let’s say your blog is named XYZ, and you aim to target the Indian audience. Then the most likely domain for the blog would be www.XYZ.in. Upon selecting the domain name, it is time to buy the domain and a web hosting account that can host the recipe blog to which the domain points. I suggest you buy a suitable hosting package from the industry’s best webhost – BlueHost. They offer a free domain too. This saves you almost $15 per year. To learn how to buy a BlueHost hosting for your blog, read the below guide, buy your first hosting and get back to follow the second step. On buying the hosting account from BlueHost, you will be sent an account login to your email id. Use this id to log into your BlueHost account. Find a tab to cPanel and follow the below video demonstrating the installation of WordPress. Alternatively, you can also follow this guide. You have now successfully installed WordPress, and your recipe blog is already up without any knowledge of coding. I feel the excitement just writing this. I can only imagine what you must feel! Now, there is a little more to it. You need to customize the blog to its niche. This can be accomplished by installing a relevant theme and plugins. A theme gives the look you desire for your blog. Many web developers can create a highly customized WordPress theme for a premium. Other options would be using a pre-designed free or premium WordPress theme. Hundreds of theme developing brands offer innumerable WordPress themes. However, not all brands are trustworthy, especially when it comes to using a free theme. Free themes may contain malware that can lead to malfunctioning of the blog. It may also compromise the WordPress account. Hence, proper research is recommended while selecting the theme. Everything fancy may not be right. Check the link below for some good recipe themes for WordPress. Once you’ve chosen a theme, you can go ahead and install it for your blog. Follow the below simple video on how to install a WordPress theme. It takes just a couple of minutes to get your theme on. You can customize your theme accordingly. Not all themes have the same features. Therefore, there can be no one way to customize all themes. While most WordPress themes come with easy, intuitive customization, you may refer the theme documentation for any clarifications if needed (you wouldn’t, in most cases). Prefer premium themes over the free ones. It would save a lot of headache in the long run. When you are buying the theme, do check whether or not they offer free theme setup. Plugins in WordPress let us extend the basic WordPress functionality. The WordPress plugin directory houses thousands of plugins, most of which are regularly updated by the plugin developers. WordPress, by default, does not come with all the features which can be implemented with the help of plugins. WordPress does not come with a feature-rich post/page editor. Installing a plugin called Tiny MCE enables extra useful features in the editor like adding headings, creating horizontal rules, etc. Akismet: For handling spam comments in your blog. Yoast SEO: To optimize your blog for the search engines like Google and Bing. Learn Yoast setup here. Limit login Attempt: To enhance security by blocking multiple wrong login attempts into your WordPress dashboard. Contact Form 7: To create a contact page for the blog. TinyMCE: Supercharges your post/page editor with extra customizable features. WP Total Cache: To enable browser caching of your blog, thereby making it load fast. WP Ultimate Recipe: Creates a proper layout to post recipes in your blog. SocialWarfare: Enables easy social sharing of your blog posts and recipes. There are many more widely used plugins but you can use the above list to get started. Go ahead and watch this playlist by BlueHost which takes you through WordPress enabling you to use it with extreme ease. Now that you have learned how to set up a food blog with WordPress its is time for you to implement this guide and share your experience and questions, if any, with us in the comments below. Happy Blogging! Looking forward to learning from you.